Today we would be returning to the USA. Our stops in Canada were short but we had fun and left plenty of stuff to do the next time we visit. We had close to 6 hours of driving per Google which for us means closer to 7 hours. 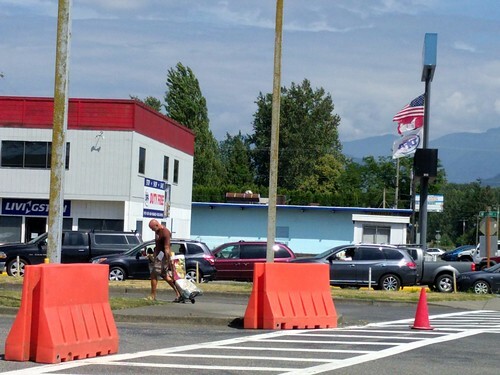 Plus, we had to cross the border. But I had learned my lesson earlier about stressing over the border crossing. This time I was cool as a cucumber! We left Kewlona and started driving uphill. We drove up and up and up. I have never gone up hill for so long in my life! Our destination for the day was Seattle which, last I checked, is at sea level. So I though that it would be a net downhill day. I can’t be sure, but if Seattle is at sea level then Kewlona must be several thousand feet BELOW sea level considering all the steep hills we climbed today. But the Beast did his job and trucked along just fine. 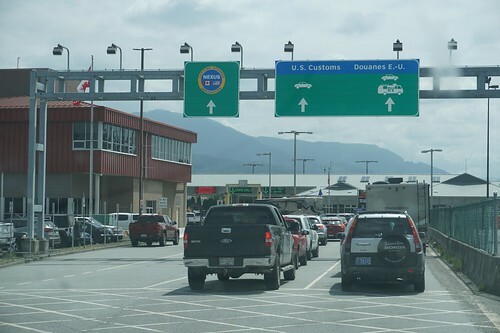 As we approached the border station in Sumas the digital signs only showed a 10 minute delay. Not as good as our Roosville crossing, but not too shabby either. But just then the digital sign changed to 20 minutes….what!!?? Oh well. It is what it is. No sense getting all spun up about it. There is nothing we can do. We’ll just wait our turn and be on our way. We inch forward in the RV lane and finally it is our turn. I’m a pro this time: I have my sunglasses off, both driver side windows down, I throw the truck into park and turn off the engine. The border patrol officer takes our passports and asks us some questions. He was very friendly and was joking around with us. He asked the standard questions, “Are you carrying any weapons? Are you carrying any commercial goods? Are you carrying more than $10,000 in cash?” I answer “No. No and No.” This is going to be a breeze! “Do you have any fruits or vegetables?” he asks. “Well, yeah” I said, “we have 2 bananas, a bag of peaches and some lettuce we bought at the grocery store “. He cringed but I got the feeling he was going to let it slide. “Ok…do you have any firewood?” he asks. “I have a little bit sir”, I admitted, “but it is actually from the US….our backyard in Colorado even!” I could tell this was not good. He gave me a bright orange piece of paper and told me to pull up and park and take the orange slip into the department of agriculture office. Alright, no big woop. Once they see the little bit of wood we have they’ll let us go on our merry way. We take the slip of paper in and the agent goes through the same set of questions again. He asks more specifics about fruits and vegetables. He asks more details about the wood and where we have it stored. He asks for details of the cash we have on us. I unlock all the doors on the trailer and the truck so he and a heavily armored and armed CBP agent can search the vehicle. They check every compartment and go inside the trailer and are in there for quite some time. Finally they come out with a lemon, a lime, a cutie orange and a red bell pepper. The CBP agent lectures us on the fact that these items are not allowed to enter the US no matter where they came from. And that firewood has not been permitted to cross the border into the US since 2009. “But, you are not the first person to do this so I will tell you what you need to do to return the wood to Canada,” he explains to us. Oh dear Lord….please do not make us turn around, wait in the line to reenter Canada just to turn around and wait again to get back into the US!! I did in fact have to do that. However, Ava, the Beast and the rest of the family all got to stay in the US while I borrowed a government issue luggage dolly, load up my firewood and haul it back into Canada on foot. I felt so ridiculous I just had to laugh out loud. I still did not know what to do with the wood once I got to the other side. But the Canadian border agent saw the piece of paper I had and without even looking up at me said, “go out that door, across the parking lot to the building that says Livingston, drop the wood off by the steps.” Ok, clearly I’m not the first guy to do this little firewood kabuki dance across the border! 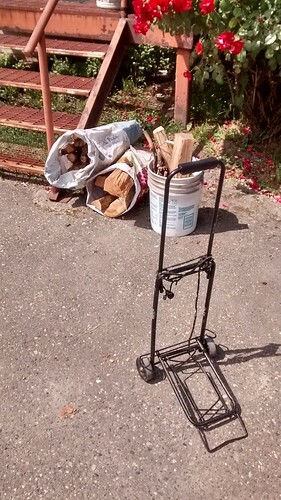 As the little cart of wood bumped along to its Canadian resting place I thought of where I had acquired the pieces of wood and how far they had traveled with us. Coming back into the US on foot was a breeze. I rejoined the family, we loaded up and continued our drive to Seattle. 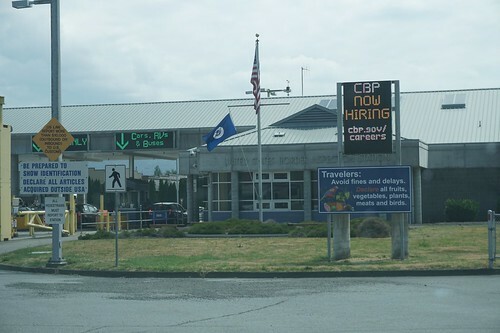 As we pulled away from the border Dacen commented, “well Papa, it looks like you used your last [dumb tourist] coupon.” I asked him if I had used it bringing wood across the border or answering the CBP agent’s questions. “Bringing wood across the border” he said, and I agreed. Part of me wished I’d answered the agent’s question differently, but it is entirely possible that our border delay saved our skin…just God’s humorous way of answering our prayers of safety. We were back home in the USA and it sure felt good! I do believe the delay saved us! There were 1 or 2 accidents up ahead that based on the Google time delay seemed like we could have been part of. Given the size of our truck and rig, the accident would have been much worse if we had been involved. Wasn’t this where one looked like someone had cut off the other person? We would have demolished them. EEk!